It’s no secret we’re massive fans of Danny Barwick here at AAA Backstage. His majesty as both an electronic and avant-garde soul artist with a classical underpinning doesn’t fall on deaf ears. 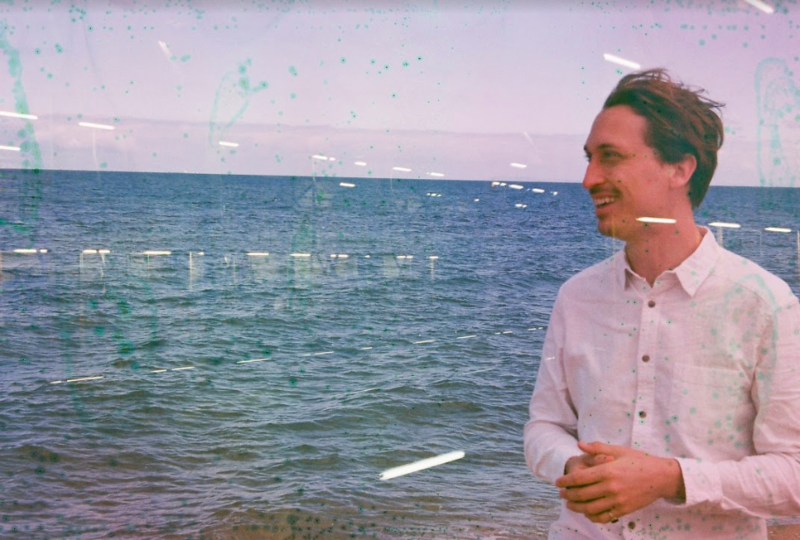 Teasing us with two incredible singles—Room 201 and Mikolka—the Melbourne artist has finally released his new EP, ‘The Tigers’. Barwick has exclusively provided AAA Backstage with a track-by-track of the release, detailing each song and the EP itself. I named the EP after an image from my favourite poet, Charles Bukowski. On the wall in my studio are his lines, “I kneel in the night before tigers that will not let me be. The tigers have found me and I do not care.” I feel that the most effective thing you can do with the more difficult emotions like anxiety, or sadness, or incessant self-criticism is to thwart them by transforming their energy into art, and these lines have helped me do that for years. The other thing that has helped me is books, and in writing this track-by-track I’ve realised that each song has sprung from a particular book (hence the album artwork by Hannah Gatland). I’ve had a long-term obsession with dreams, and I’m especially fascinated by recurring ones. Many times through my life I’ve dreamt of falling, often through an open sky or to the bottom of the ocean. At one point, this dream became quite troubling as it began to play every night, so I wrote this song to give it somewhere else to live. It worked. As I wrote the song, I was reading Dostoyevsky’s Crime and Punishment. In one chapter, the main character is visited by a particularly terrifying dream character named Mikolka. As I read about him, the parallels to my own dreams were far too strong to ignore, so he wormed his way into the song’s lyrics, eventually becoming its title. This song came from a particular experience with Psilocybin mushrooms. I’m a big advocate of using them to explore otherwise untapped areas of creative perception (it’s laughable that our present culture has outlawed a fungus). One night, my friends and I were camping and as the mushrooms began to take hold, I was drawn out into the forest alone. The next three hours were monumental for me. The forest teemed with characters and it seemed that there was a childlike playfulness intrinsic to the world that I had never noticed before. A few weeks later, I was reading Alan Watts’ diaries of his experiences with LSD, appropriately titled ‘A Joyous Cosmology’. I was stunned to read almost identical realisations to my own experience. So this song became an attempt at elucidating these experiences musically. Since childhood, I’ve been obsessed with religious texts—there seems to be something so primordial and archetypal about stories that survive countless generations of retelling. I think it’s hard to find any more deliciously macabre than those in the Bible. The martyrdom of the apostle Paul has always seemed to me a standout in terms of its tension and imagery, and it came to mind as I was writing this instrumental. I decided to follow that image and retell the story in my own way. If I had to pick my favourite poem, it would be Charles Bukowski’s ‘The Crunch’. Particularly the harrowing lines, “An old guy in a cheap room, with a photograph of Marilyn Monroe. Many old guys in cheap rooms without any photographs at all.” When I first read it, the quiet loneliness of that scene struck me so much that I found myself imagining more about the old guy—why he was alone and what he was doing in that cheap room. In time that backstory turned into this song. When I was a child, my Dad used to read me to sleep with Mervyn Peake’s ‘Rhymes Without Reason’. It’s a beautiful collection of illustrated poems that are simultaneously silly, serious, and full of rich images. They’re well worth reading now, even as an adult (as is everything Peake ever wrote). This song is both my version of a Rhyme without Reason, and also a testament to my obsession with outer space. The space obsession continues. I’m particularly interested in terraforming/planetary engineering, because it seems like something humans may have forced themselves to do. It’s imagined beautifully in Isaac Asimov’s ‘Pebble in the Sky’ (a stunning phrase which I reference in this song’s lyrics). As I was reading this book, it really struck me just how terrifying and wonderful it would feel to leave our home planet and colonise new ones. I wrote this song about that feeling.